Once again, the #WestchesterSmart Mobile App Development Bowl enabled hundreds of talented young high school and college students showcase their STEM skills in a competition to build apps to improve the lives of older people. 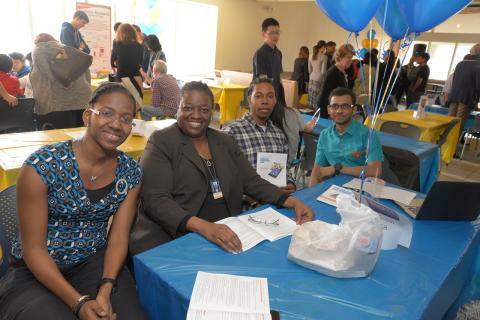 In partnership with Westchester County, this year’s iteration of the competition was its biggest yet, with over 440 students from 18 high schools and three universities taking part. The mobile app bowl takes place over three monthly sessions, the first two consisting of intense training where students learn how to build mobile applications catered to aging populations. On the third day, which took place on Friday, April 28, at Pace University’s Pleasantville Campus, teams presented their apps and the winners were decided. 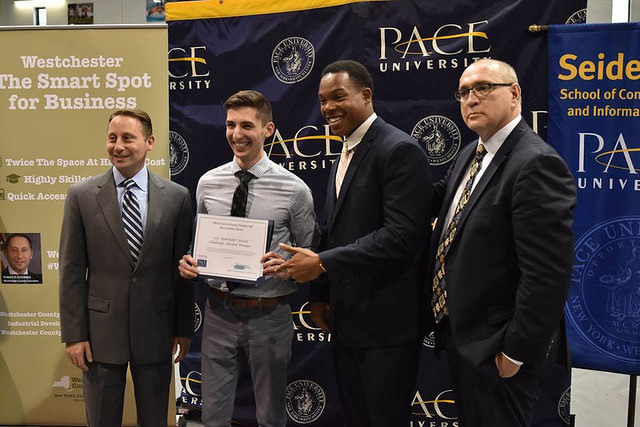 County Executive Robert P. Astorino presented the awards to the winners in a variety of categories, including awards for creativity, usability, and functionality. Winners of the YouTube Social Challenge earned trips to Google and YouTube studios in New York City, and prizes were also given for high school coach of the year and college coach of the year – the latter being won by our very own Jean Coppola. On top of the category awards, the #WestchesterSmart award, a grand prize of $1,000 cash and swag from Panasonic was up for grabs. 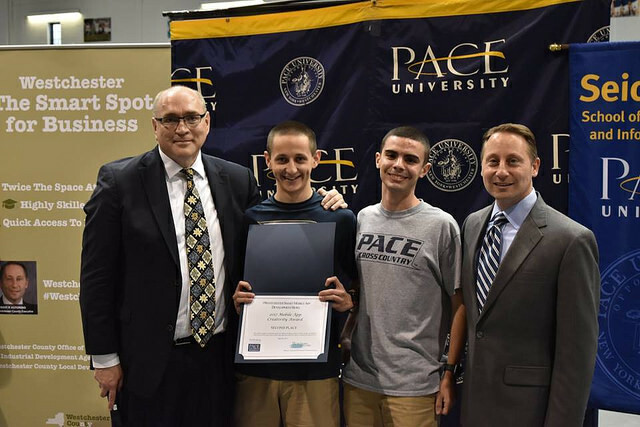 “The #WestchesterSmart Mobile App Development Bowl sends a strong statement to our students, as well as our communities and businesses, that Westchester is a place where smart things are happening,” said County Executive Rob Astorino. The grand prize was snatched up by KanjiStick, the team from the New School’s Parsons School of Design, who created an app aimed to assist older people overcome issues typically experienced when interacting with technology. The team focused on creating an app that assisted with hearing, vision, and dexterity problems, allowing users to enjoy a smoother experience. Teams Run DMR and Programmers Box took second and third prize in the Mobile App Creativity category respectively. Team QWERTY won second place in the Mobile App Usability category. In the Mobile App Functionality category, teams Bice and Programmers Box achieved second and third place respectively. Tours of Google and YouTube were won by Downtown Developers, and Vida is Real. The full list of winners can be found at our #WestchesterSmart Mobile App site. We would like to extend many thanks to our 2017 Partners and Sponsors, including Robert P. Astorino, Westchester County Executive; Seidenberg School of Computer Science and Information Systems at Pace University; The Westchester County Office of Economic Development; Saberpoint; conEdison; Acordia Therapeutics; XL Catlin; The Bristal: Assisted Living; New York-Presbyterian; Virginia LeTourneau; Ursuline Foley; Liberty Lines Transit, Inc.; Sal’s Pizza and Pasta; and Nancy Goodman. Read about last year’s mobile app development bowl. 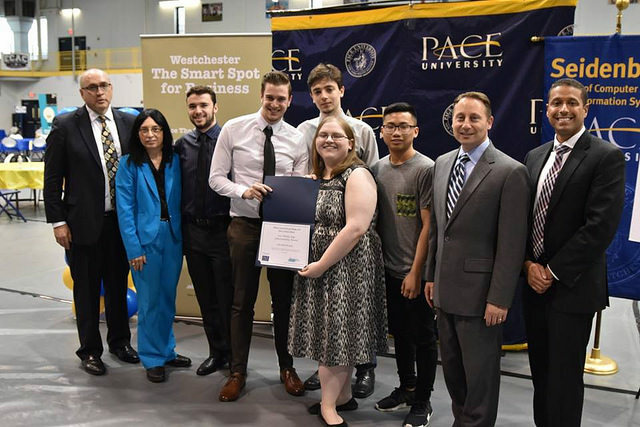 The third annual #WestchesterSMART Mobile App Development Bowl is almost ready to kick off at Pace University, but there’s still time to register for the chance to win cash prizes, paid internship, and plenty of awesome tech gear. 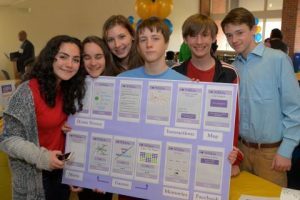 The Mobile App Development Bowl is run through a partnership with the Seidenberg School and Westchester County’s Office of Economic Development. The free-to-enter event, which puts teams of college and high school students in competition to create the best mobile apps, will commence officially on February 3 with a pep rally and design and development workshops aimed to teach competitors how to build quality mobile apps. As ever, teams must build MAAPs – Mobile Apps for Aging Populations. The prevalence of technology grows along with our population, and there is a great opportunity to use technology to improve the daily lives of people aged 65 or older. 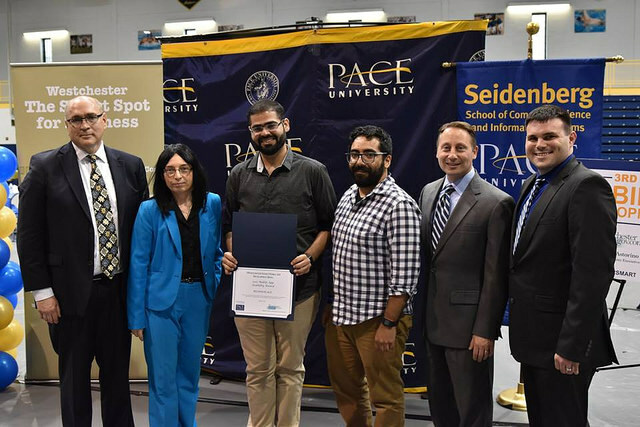 Creating apps, hardware, and other bits of tech for aging populations is part of a field called gerontechnology, which is one of Seidenberg School’s research areas. The idea is to research ways in which technology can be used to improve the daily lives of older people, and many excellent solutions have been explored by students at the mobile app bowl in the past two years. Despite being heavily underrepresented in the mobile app development field, the aging population is the fastest growing consumer group, meaning that a focus on older mobile users is key to keeping the app development industry vibrant and innovative. It’s also an excellent opportunity for students from the Pace community and beyond to hone their skills, get some real world experience, and feel out potential career paths. Over two sessions of workshops before judging on April 28, teams will work together to build an app that truly aims to do some good in the world. Last year’s event included extensive news coverage and was attended by Westchester County Executive Robert P. Astorino. 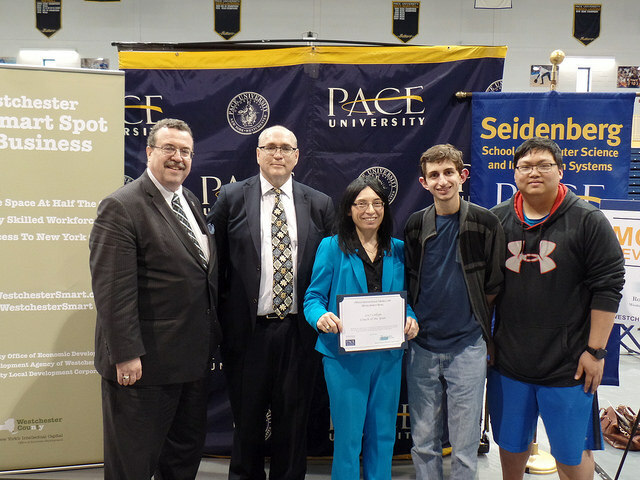 The series was created by Seidenberg faculty member Jean Coppola and brought 250 students to Pace’s Pleasantville campus to compete in the 2016 challenge. If you have an idea for a mobile app or want to take part in an exciting challenge that helps the community, register today. Registrations are open for both teams and individuals, who will be placed into teams before the kick off. Check out our dedicated #WestchesterSmart Mobile App Development Bowl page for further info.